The National ASCE organization was founded in 1852, represents approximately 130,000 members of the civil engineering profession worldwide, and is America’s oldest national engineering society. ASCE’s mission is to provide essential value to our members, their careers, our partners and the public by developing leadership, advancing technology, advocating lifelong learning, and promoting the profession. Locally, the Cincinnati Section, which was founded in 1920, currently has approximately 650 members. The Section is in Region 3 of the National society’s geographic regions. The Cincinnati Section serves the Southwestern Ohio, Southeast Indiana, and Northern Kentucky engineering communities. 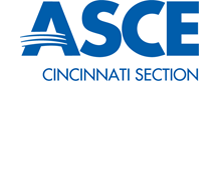 The Cincinnati Section of ASCE has three committees: Educational Outreach, Membership, and Programming. The Educational Outreach Committee works with local schools to introduce today’s youth to the world of engineering; the Membership Committee is dedicated to retaining and recruiting current members by increasing membership value and incentive; and the Programming Committee helps plan upcoming ASCE meetings and events in order to produce a more diverse program year. Currently, a fourth committee - the Sustainability Committee - is in the process of being formed. In addition to the Committees, the ASCE Cincinnati Section also consists of two Student Chapters - the University of Cincinnati, and Cincinnati State Technical & Community College - and a Geotechnical Group, which is a subsidiary organization of the Section. If you would like to learn how you can get involved with the Section in any way, just fill out the form below, and an Officer will get in touch with you. We also have monthly meetings that are open to all to attend. Please see the Events page for more information on how to attend a Section Event.